Has your home ever blown a fuse during the summer from running window air conditioning (AC) units? Well, it has happened to me. My roommates and I live in an old renovated three-story home, and it gets hot in the summer. When the temperature gets close to 90 degrees, we can’t help it – we tend to put on our air conditioners, which contributes to summer peak. We find lots of justifications for running the AC; things like wanting our cats and dog (and ourselves) to be comfortable come to mind. We know it’s not sustainable, but we want to be comfortable, so we opt for “low cool” modes or gather the animals into the room with the most efficient unit. Our electric bill goes up, but we expect it; it’s a social norm to expect your electric bill to go up in the summer. So what can be done about summer peak load? There are many reasons why reducing peak demand is important. For the customer, peak demand may result in monthly charges higher than base electric rates. When there is an increase in demand, additional power plant capacity is called upon. This causes imbalances in the power grid and may result in increased air pollution. Consumer demand is one of the two main drivers of wholesale electricity prices in New England. (The other main driver being the cost of fuel). Electricity demand is driven primarily by weather, time of day, and economic factors. Reducing demand reduces the exposure to economic risk, improves grid reliability, and reduces carbon emissions. All of which benefit society and the environment. Energy efficiency and demand response have managed well in capacity markets, resulting in demand savings. Energy efficiency and other demand-side resources can replace existing and planned generation that may have a higher carbon footprint and/or higher costs. By including energy efficiency in capacity markets, carbon reduction policies and targets are reinforced throughout the region. Energy efficiency decreases carbon emissions because it reduces the need for energy use. These energy savings and peak demand reductions from energy efficiency programs also help reduce system costs and improve customer experience. The focus for peak demand reduction is often summer peak, as illustrated in the graph below where summer savings dominates over winter, but ample savings can be achieved during the winter as well. Winter demand tends towards natural gas savings since demand increases in the region for space heating. In New York, no winter demand savings were reported for electric savings, although roughly 244,000 therms of savings from the gas meter level were reported for 2015. The savings presented below are electric demand savings. To achieve the peak demand savings represented above, utility programs and incentives are put into place to engage customers in energy efficiency, which helps customers reduce energy costs while also helping the grid. Each sector offers a number of different program types. As shown in the pie chart of net summer savings by sector, commercial and industrial programs deliver roughly two-thirds of the savings. New construction programs (all sectors combined) contribute about 14 percent of savings, and residential behavior programs deliver an impressive nine percent of savings. One area that would benefit from more demand savings is the low-income sector. In the pie chart below, the low-income block accounts for a mere two percent of total demand savings. Working towards equitable access to energy efficiency programs across sectors is an important factor if the region wants to reach any energy savings or carbon reduction goals. 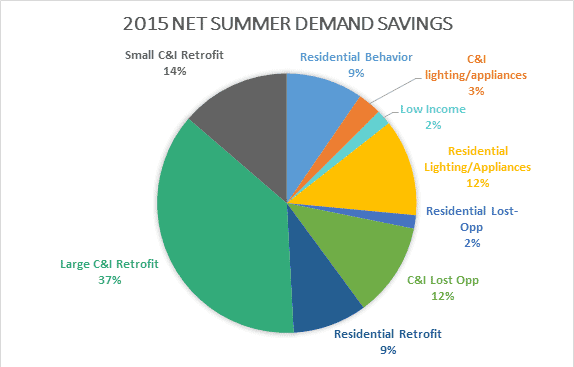 Residential demand savings account for 32 percent of summer savings with retrofits and behavioral programs coming in for a tie. Comprehensive home energy retrofits can yield extensive energy and peak demand savings, but are typically high in costs. Deep retrofits go beyond low-hanging fruit and customers typically value non-energy impacts when deciding to move forward with these programs. These types of benefits typically include increased comfort, improved health, and environmental impacts. When utilities implement programs that incentivize retrofits, high levels of demand savings can be achieved. Connecticut has also been a leader in the region, achieving 3.5 MW of peak savings from the Home Energy Solutions Program and 12.5 MW of savings from residential behavioral changes. The Home Energy Solutions program provides a home energy assessment by a certified technician to identify ways to save money through air sealing and weatherization, LED light bulbs, Wi-Fi thermostats, and diagnostic testing. While the 3.5MW of peak demand savings are attributable to the energy assessment and measures installed, many of the services provided by the program contribute to the behavioral changes of customers. Connecticut also offers an income eligible version of the program to provide equitable access to energy efficient solutions for the home. Behavioral demand response programs are based upon residential customer engagement, rather than direct load control. These programs work to change the way customers understand and use energy. When enrolled in a behavioral demand response program, consumers often receive a report on their performance as compared to the average performance of their neighbors, providing a behavioral incentive through gamification of energy savings. There have been various successful programs in this arena. One successful program contributing significantly to demand impacts in Maryland is the residential behavior program implemented through the smart grid initiative. In 2015, the program saw 34.13 MW of savings in the summer. This has been due to the focus on customer education and communication throughout the deployment of advanced metering infrastructure in Maryland. 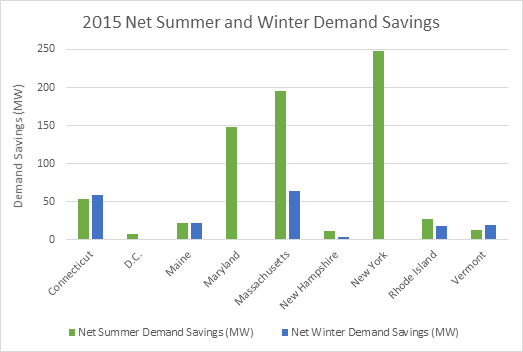 Connecticut has also seen an increased level of demand savings from the residential behavior program, achieving 12.52 MW of savings in summer 2015. While these savings are a good start, there are further savings that can be achieved through behavioral programs. New innovations in dynamic pricing may enable customers to more closely monitor their behavior. Customers that enroll in peak time rebates, time-of-use pricing, and the like, have the opportunity to lower electricity use during peak periods, which often occur during the summer because they are incentivized to shift load intensive activities off peak. Smart grid deployments lead to new ways of time-shifting demand. Improvements in buildings and appliance performance, due to more stringent building codes and efficiency standards, will also continue to contribute to demand savings. On the C&I side of demand savings, there are various energy efficiency programs available to large customers that cover retrofits, lighting, and appliances. In Maine, a significant portion of demand savings comes from the C&I sector. For example, in 2015 the Business Incentive Program saw seven MW of savings in the summer and 7.34 MW during the winter. The Efficiency Maine Business Incentive Program offers prescriptive incentives for high efficiency lighting protracts, compressed air systems, HVAC equipment, commercial refrigeration, and variable frequency drives. In 2012 Efficiency Maine also launched the Large Customer Program targeted towards customers with a peak load of at least 500 kW. The Large Customer Program resulted in two MW of demand savings in the summer and the winter. Programs targeting small C&I customers help build relationships between the state, utilities, and customers because this sector is often “forgotten” in energy efficiency programs. Considered to be hard-to-reach, small C&I customers represent a majority of businesses in the United States and consume about 20 percent of U.S. energy. While New York has fluctuated over the years in the level of summer peak demand savings, the small business direct install program for small C&I retrofit has not fallen short in summer savings. The summer of 2015 saw 43.45 MW of peak demand savings. This program offers free energy assessments and up to 70 percent of costs for recommended upgrades covered to businesses with demand of less than an overage of 110 kW per month. Upgrades range from LED lights to commercial refrigeration upgrades, which target the high level of demand coming from lighting and appliances in the commercial sector. There are programs targeting energy efficiency across all sectors, and this sample shows the merit in implementing these programs because they lead to demand reductions during the highest levels of demand during the summer and the winter seasons. Continuing to invest in residential retrofit and behavioral programs as access to smart devices and time-of-use rates become readily available will result in even more avoided peak demand. When implementing programs for the C&I sector, it is important to address the differences between commercial and industrial customers, as well as the difference in incentives for small versus large C&I customers. Education and marketing are important for all sectors to understand the benefit of participating in the different programs available across the region. By investing in and understanding the customer, energy efficiency will continue to deliver peak demand savings (making summer and winter more comfortable and affordable), and make the grid more reliable and economically efficient. As a utility customer that enjoys comfort during the summer season, incentives to change energy consumption behavior would definitely benefit me and my roommates. We might even get lucky by avoiding a blown fuse too.